East Lake View Neighbors (ELVN) wants to bring to your attention a special meeting of the Commission on Chicago Landmarks. The Commission on Chicago Landmarks will hold a special meeting on THURSDAY, JUNE 27, 2013, at 10:00 a.m. in City Hall, 121 N. LaSalle St., 2nd Floor, in City Council Chambers. Proposed renovations to include 4 new exterior additions, relocation of the perimeter wall at Sheffield and Waveland to accommodate bleacher expansion, the installation of new outfield signs, and a new roof deck. These changes could change the ambiance and residential character of residential streets adjacent to Wrigley Field as well as negatively impact the operation of our rooftop neighbors. It is important that our community be fully represented at this meeting and the Commission members hear the concerns of the East Lake View community. Plan to attend if you can. We would also like to bring to your attention the opportunity to participate in an online survey being conducted to document the concerns of the Lake View Community regarding the redevelopment of Wrigley Field and the adjacent area, (www.wrigleyresidents.com), the results of which will be shared with the City of Chicago. This entry was posted in Community News and tagged City of Chicago, Cubs, Wrigley Field on June 24, 2013 by elvn_updates. The Chicago Cubs have announced Friday start times for the remainder of the 2013 season. The four Friday games listed below previously marked as TBD are now scheduled for 3:05pm, CDT. This entry was posted in Community News and tagged Cubs on June 10, 2013 by elvn_updates. 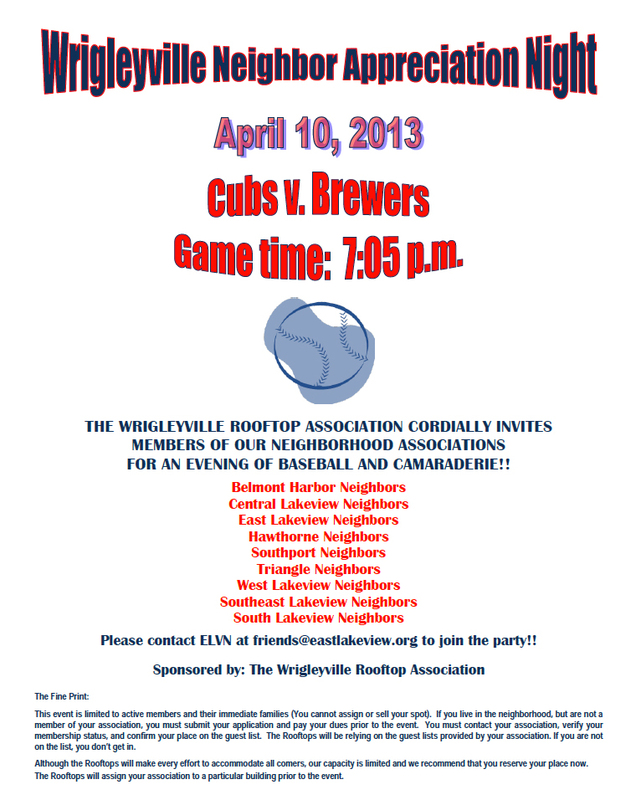 Wrigleyville Neighbor Appreciation Night is coming up! If you are interested in attending, your ELVN membership must be paid up. Please RSVP for this event by 7pm on Tuesday, April 9, 2013, to friends@eastlakeview.org. You will be notified by email of the address of the rooftop where this event will take place by noon on Wednesday, April 10th. This entry was posted in ELVN News and tagged Cubs, ELVN on March 26, 2013 by elvn_updates. 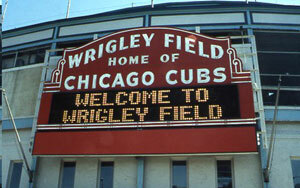 The 2013 Wrigley Field Advisory Community Meeting is scheduled for Tuesday, March 26, 2013, at 6:30 p.m. 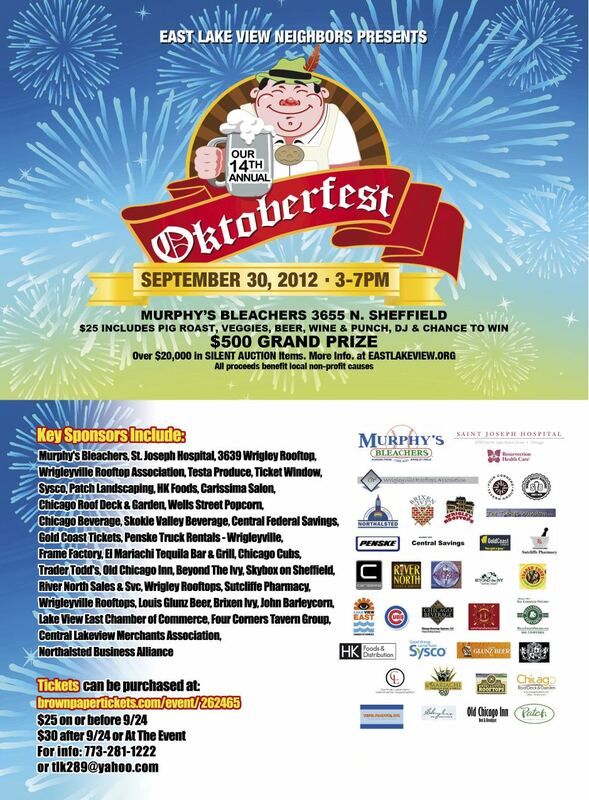 It will be held in the Community Room of the 19th District Police Station (850 W. Addison). Be reminded, East Lake View Neighbors is a branch of the Lake View Citizens Council (LVCC). Read the letter sent to Mayor Emanuel from LVCC (.pdf) that notes the shared concerns of our Community regarding what is being proposed by the Cubs. Also, read the letter sent to Alderman Tunney from LVCC (.pdf). This meeting will be your opportunity to ask questions and voice your concerns to involved City officials, and to show support for positions taken by Alderman Tunney. This entry was posted in ELVN News and tagged Cubs, Wrigley Field on March 14, 2013 by elvn_updates. ELVN Community Meeting – Let’s talk Wrigley! 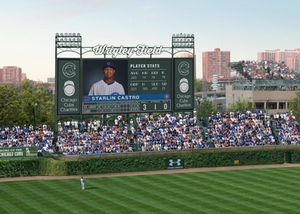 Let your voice be heard about Wrigley Field. Please join us to talk about issues that will affect your neighborhood for the next 30 years. If you have never been to an ELVN meeting, it’s a great way to meet your neighbors! WHERE: 19th District Police Station Community Room, 850 W Addison St.
**Reminder: To be eligible to vote in this election, ELVN dues must have been paid by February 19, 2013. This entry was posted in ELVN News and tagged 44th ward, 46th Ward, Cubs, ELVN, Wrigley Field on February 18, 2013 by elvn_updates.